Automate Windows Computer Hibernate and Resume it as per defined schedule. Simple, Easy and Quick software application presents a single window which allows to define when you want to hibernate your windows computer and provides another quick way to configure at what day and time, must the computer be resumed. You can even configure the software to restart the computer automatically after the windows computer is resumed. Have a look at the given below screenshot of the software, which tells all about what it can do and how easy it is to auto hibernate and resume your windows computer. This Software works on Windows 7, Windows 8 and other versions of Windows as well. In case you are using this Auto Hibernate & Resume Software on a laptop, just remember to keep the power connected to your laptop , so that the software presented here can be resumed. For Desktop computer, the power supply must be kept connected at all times so that the Auto Hibernate & Resume Software can wakeup the computer at defined day / time. Once the computer is resumed, you can also configure the software to restart the computer. 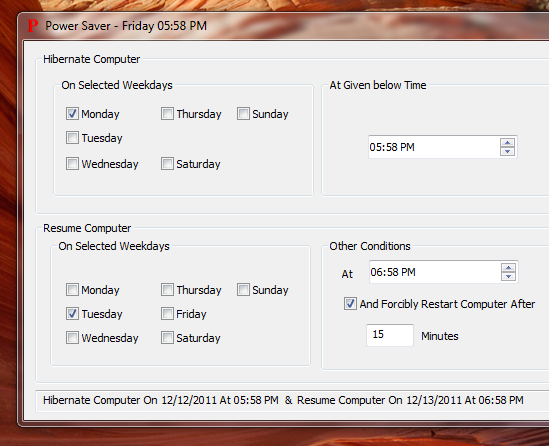 Auto Hibernate, Resume and Restart can save power consumed by your Windows Computer. In case you do enable the Restart option, you can get your computer totally fresh at the configured time, whereas your computer has slept (was in Hibernation mode) as configured. Once you download, install and launch the software, it will start in system tray. To view & configure auto hibernate & resume commands, you would need to double click on the system tray icon. Once you are happy with the Hibernate, Resume and Restart commands configured according to the days selected, you can click on the top right cross button to hide it to system tray. In case you would like to disable or deactivate the Auto Hibernate and Resume commands temporarily, you can right click on the system tray icon of the Auto Hibernate & Resume Software and select the Exit option.